Lots of people have been discussing elderberries and their possibly antiviral properties, in various places in the forums. I just planted two elderberry bushes and thought I'd pass on info on that for anyone who is interested. I planted them mainly because I want to make jelly and syrup from them--they're delicious! Sort of like a cross between blackberry/blueberry flavor. However, you can't eat them raw. They must be cooked. If they also have antiviral properties, that's great, and it will be a lot more fun for my five-year-old to eat elderberry jelly on toast or drink elderberry syrup than to take a nasty-tasting tincture when he's sick. Anyway, here's what I found out. You need to plant two different varieties of elderberry for them to pollinate each other. Otherwise, you won't get any fruit. So don''t just plant one bush: gotta have two. These are nice-looking bushes that can get to be 12 or more feet tall. They have lush leaves and produce loads of berries. Birds love the berries, so you might have to invest in a net to put over the bushes if you want any berries left for yourself. They have few pests or diseases and the one bug that does bother them (elder beetle) is not a big deal. I got my bushes from St. Lawrence Nurseries in upstate NY. They will only ship plants in early spring or late fall and they are done shipping for this spring. But I found other nurseries on the net that have them. Just google "Black Elderberry" or "sambucus nigra" (the botanical term). You can also add "plants" to your search and that will weed out all the sites that sell premade syrups or tinctures but no plants. These bushes grow wild in much of North America but it's a lot more convenient having them in your yard than having to go hunt for them on other people's land. Once you know what they look like, though, you will see that they are truly everywhere. By the way, there are also "red elderberries" but they are not edible. In fact, they're poisonous. Black Elderberry leaves and twigs are poisonous, but you're not going to eat those. Just thought everyone should know that, though. The twigs are naturally hollow so some people have been tempted to make whistles from them. Not a good idea, because this can lead to poisoning. Just use the black berries, make delicious jelly/syrup from them, and enjoy. Thanks for the info. I just ordered two elderberry bushes and am glad to have the information before planting them. Great info! I guess I will have to try and order some. I went to my local Lowe's, and they said they were supposed to get a shipment, and they never came. How do you know if you're getting two different varieties? What two did you get? I would also like to know what they look like can you post an image? They were on sale 75% off last week. Not all the Lowes had them. Mine have dark red leaves. I planted 2, have one more to plant. It's raining here today, so It's just too muddy to work outdoors now. Mine are all the same variety. I will have to order cuttings on the internet in the spring if I want another variety. Just in case anybody needs the info. We grow elderberries commercially, mostly the two kinds Nova and York, because they work well in our area. You do normally need two bushes for better fruiting. They grow very easily, you can even propagate them from cuttings. The best time for that is early spring, but we have done this in summer as well, just to see if it works. It's just more work then. Our family uses them for their general health benefits, including the flu. We grow them, because I grew up in Germany, and that is what my grandma used as a first remedy when any of us got sick during the flu season. 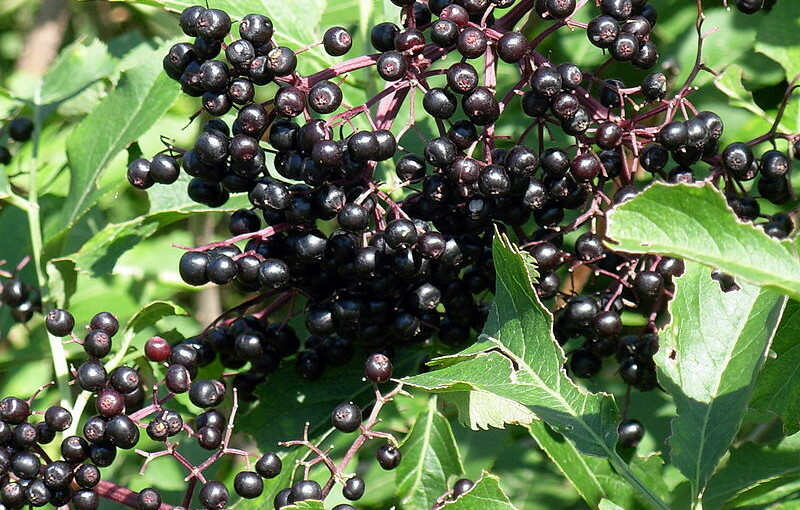 You can read up about it very easily by googling the health benefits of elderberry. Early this year our 3 month old got the RSV virus at the sitters. We started her on one teaspoon of elderberry juice, three times a day. All the other kids at the sitters were in the ER and looked like the walking dead for over a week. She started to get it, but never developed the fever or the accelerated heart beat. Of course we first saw her pediatrician, he put her in the hospital, for observation. I stayed with her over night. Like I said above, she didn't get the accelerated pulse, never broke a temperature. She did get a little hoarse and she did get a full nose. They sent us home the first morning, because there was nothing else they could do for her. After four days she was done with all of it. She is nine months old now, and except for that one time she got sick at the sitters, she has not been sick a single day. Just like the rest of the family she receives a little bit of elderberry juice in her diet each day. We drink it ourselves, instead of pop. Sometimes we mix the juice with other juices. We also make jelly from it, not really for the health benefits, but because it tastes great. My recommendation is, if you plant bushes, be aware what kind they are. Red and Blue elderberries do not have the same benefits and some are not healthy. There are many kinds sold, several of them because of their high yields. Don't go for that. We tried many of them, and yes the yield is higher. What they forget to tell you is, the pest with the biggest problem for us is the Japanese beetle. They like most of the varieties. They leave Nova, York, Bob Gordon and some other ones alone. Those beetles can defoliate a bush in a few days. We like the proven performers. Plus, their berries are bigger and sweeter. That's another thing, they don't all taste good. When do you harvest? Your window is kind of short. You harvest the berries when are black and starting to become dull. They go from shiny to dull in a few days. Shortly after they become dull, they will fall off the bush. At the dull stage, they are easy to de-stemm and they a little sweeter. We usually use a machine for taking off the stems. If you don't have one, you can stick them in a big plastic bag and freeze them overnight. The next day you take the bag out of the freezer. You can now shake the berries right off the stems. Plus, the freezing takes a little of the bad taste off too. Anyway, if you have any questions, please feel free to contact us. These are elder berries. Those who are concerned about their healthy life may have them as they have good amount of Vitamin A, B and C. If you are unable to find them fresh you can have canned berries. You must also try another healthy fruit i.e. Noni. They are full of antioxidants that can help you to maintain good health and they are easily available in market as Organic Noni Juice. Most of the people don't now about this fruit but it is really healthy.